Image Size: 19.5 X 16 in. Inevitably, there will be a time when we are called upon to jump on stage and entertain. Some can conjure up William Shakespeare, some a great soft-shoe and still others, an impressive John Wayne. The rest of us, with more average skills, may feel we have to puff-up our simpler, one-trick magic acts by, say, dressing up our pet fish. We may add some extravagant attire and perform with authority and professionalism to help us find our own audience. But if we really thought about it, if we were to remove that mask, we realize a fish that floats in the air out of water is quite an extraordinary. 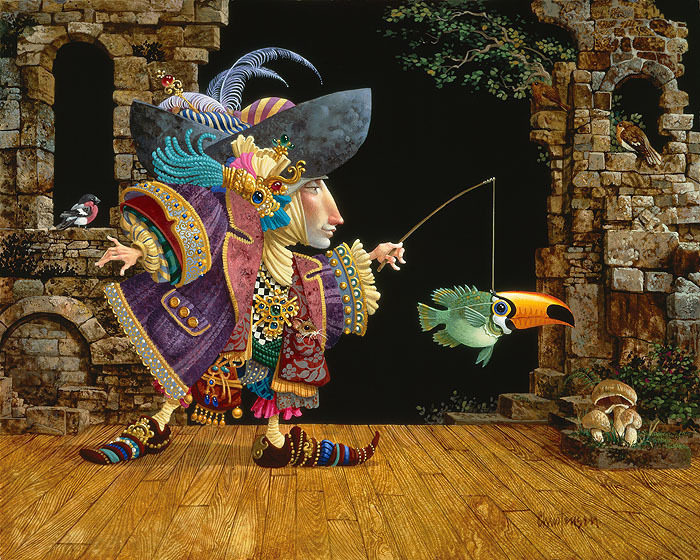 "Fish in a Toucan Mask" is one of a series of three paintings Christensen created around entertainers aggrandizing their one-trick acts. Closely related are "The Great Garabaldi" and "Levi Levitates a Stone Fish." In each, the magician becomes more flamboyant, more comfortable with his on-stage presence, the show overwhelming the act of magic itself. Yet, with each, there is still magic in the air.